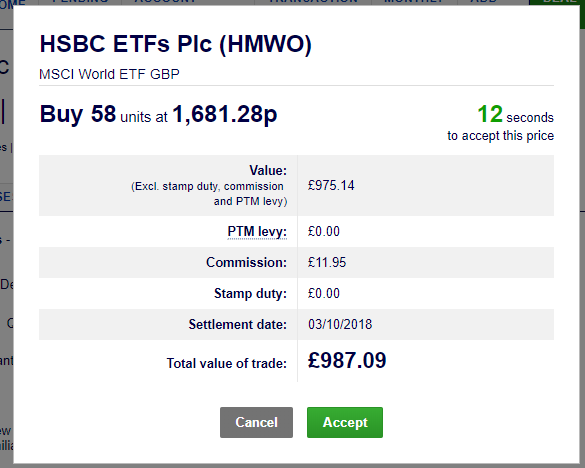 Okay, so you know how to open  an online broker account . The next step on your road to fully-fledged investor status is to actually purchase some investments. There can also be a divergence for brief moments in extreme market turbulence – again usually only with smaller ETFs, or those holding more exotic stuff such as  rarely-traded corporate bonds. Neither factor should concern a passive investor. We should be choosing ETFs that track broad indices, and watching Netflix rather than  our portfolios when the market throws a wobbly. Let’s get trading! To start we need to navigate to the trading screen. We’re using Hargreaves Lansdown  in our example, but the process is similar for other platforms. First off, we need to find the ETF  we want to trade. We find it by searching for its ticker symbol. The ticker is the unique name given to each traded security on the stock exchange. You’ll find the ticker on an ETF’s factsheet , or perhaps from an article like our guide to low-cost funds  for passive investors. The bid/sell2  price reflects the market demand for the ETF. That is, what the market will pay for your holding. 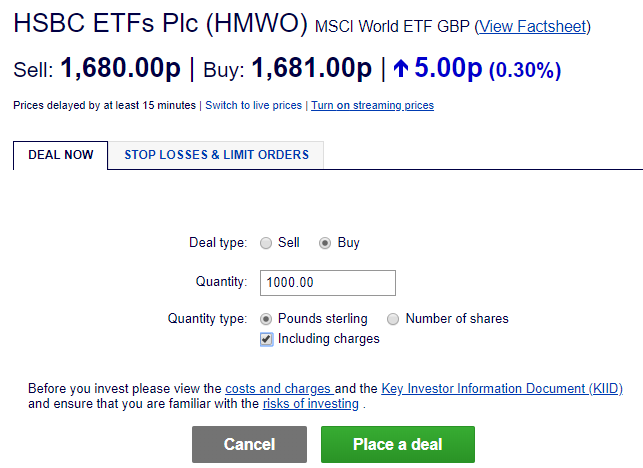 For our example ETF, the spread is very small at around 0.05%3 . The ETF we’ve chosen is a large and highly traded security. Stop losses and limit orders are different. You don’t immediately buy and sell with these orders. Rather, they are instructions to sell or buy a security if it reaches a particular price, which you set yourself. The idea is you don’t pay more than you want for your chosen security, nor sell a holding for less than you want to get for it. Passive investors in large liquid ETFs can ignore all this, but The Investor has written an article  about these more advanced trading options if you’re curious. 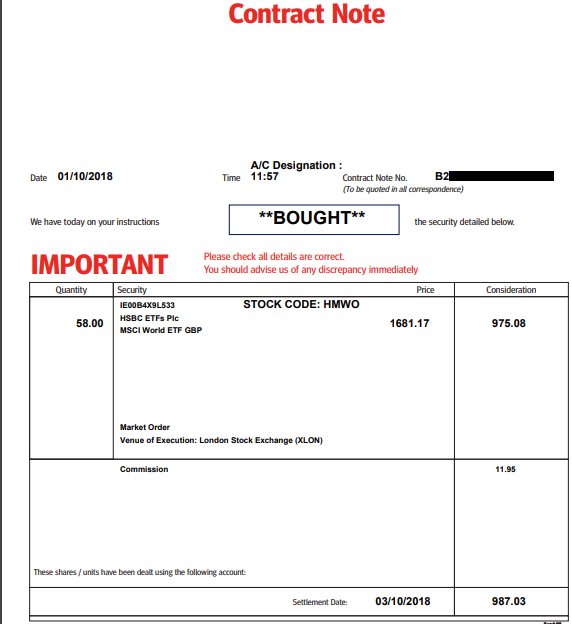 PTM Levy – This is an extra £1 charge made when you buy or sell London Stock Exchange listed shares with a total trade of more than £10,000. It’s used to fund the Panel of Takeovers and Mergers (PTM). The PTM levy is not chargeable on ETFs.5  So we didn’t pay a charge. Stamp Duty – Not to be confused with stamp duty on property (technically, that’s called Stamp Duty Land Tax), this is an additional 0.5% charge levied when you buy shares. 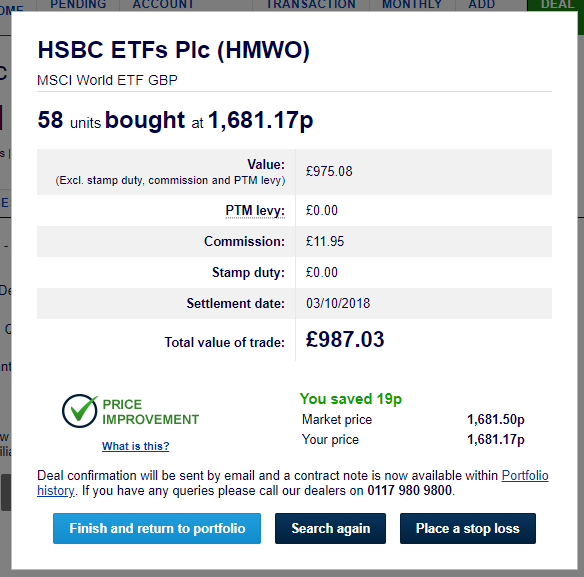 You don’t pay Stamp Duty when buying an ETF. So again, we didn’t have anything to pay here. That leaves more money for us to compound  over time – result! Settlement Date – The date at which ownership of the security is transferred. We bought our ETF on 1/10/2018, and it won’t be settled until 3/10/2018. This delay is to reflect the process of legally transferring ownership between buyer and seller. In practice this isn’t a big deal – if you sell via your broker, the money will appear in your account and you can use it to purchase new investments. If you buy, the holding will appear in your list of holdings.6  For ETFs and shares, settlement is ‘T+2’ – that is, two days after the trading day. For Corporate Bonds settlement is T+2. For Gilts, T+1. Just remember to do your research in advance, and avoid getting drawn into day trading  or other wealth-sapping activities. Make your well-researched investments, then go and do something fun and leave them to grow. Are you ready to invest? Have a look at some low-cost funds  we favour. Read all The Detail Man’s posts on Monevator , and be sure to check out his own blog at Young FI Guy  where he talks about life as a financially free twenty-something.